Game of Thrones picked up the pace Sunday night, with the second episode of the fifth season “House of Black and White.” The plots started to thicken as show creators David Benioff and D.B. Weiss start to deviant from George R.R. Martin’s novels, and in the most interesting ways. In King’s Landing, Cersei is cementing her control over… well everything. She convinces Jaime to go to Dorne to rescue their daughter Myrcella, who Tyrion had promised to the Martell’s during his tenure as Hand of the King. She puts the Small Council in a stranglehold, as her uncle Kevan Lannister departs King’s Landing for Casterly Rock to await word from King Tommen, Cersei’s son. Maester Pycelle is quite disgusted at mad scientist Qyburn joining the Council, his point accentuated when men bring a head presumed to be Tyrion’s to Cersei and when she tells them it isn’t him and to dispose of it, Qyburn requests the head for experimentation. For his journey, Jaime recruits Bronn – the sellsword pal of Tyrion’s. We catch up to Bronn as he is making future plans with the woman Cersei promised to him for walking away from Tyrion. Jaime promises him a more prestigious wife for his service and lets him in on the plans to travel to Dorne. In the north, Stannis and Daavos try to persuade Jon Snow to give up his oath to the Night’s Watch and become Jon Stark, Lord of Winterfell and Warden of the North. Snow, of course, refuses. Instead, his pal Samuel Tarly throws him into a vote for the new Lord Commander and Snow wins by some miracle. His nemesis, Alliser Thorne, gives him a cold stare after the Wall’s Maester Aemon Targaryen votes for Jon as the tiebreaker. The big question we posed last week was answered in the intro of the episode, as Arya Stark comes to the House of Black and White. Her adventure seems to come to a quick end as she knocks on the door and shows an old black man the coin given to her by Jaqen H’ghar. The man tells her there is no one there by that name and closes the door in her face. She spends the next day or so staring at the coin and reciting her kill list through rain and shine. Finally, she tosses the coin into the water and walks away. As she catches a bird to eat, she is accosted in the street by a group of young men who want her sword. They turn and run from her when the old black man shows up. Arya follows him back to the black and white doors where the man pulls off his face, quite literally, and reveals he is Jaqen H’ghar. Back in Westeros, Arya’s sister Sansa is seen in a diner by Brienne and Podrick. Sansa refuses Brienne’s oath to protect and Littlefinger’s men attack. During the retreat, Podrick loses his horse and Sansa leaves with Littlefinger with the pair in hot pursuit. The highlights of the episode take place in Meereen and in Dorne. The plots get the most interesting in these two places far removed from Westeros where the pace is accelerating very slowly. Daenerys’ forces have captured a Son of the Harpy and there is a call to simply execute the man. Barristan Selmy practically begs Dany for a trial, and in doing so tells her a story of her father, the Mad King. The scene truly builds the backstory of Westeros and possibly sheds some light on why Jaime Lannister became the Kingslayer. Selmy tells her of her father doing what he thought was right with no regard to the people, and actual justice. Later in the episode, one of the members of Dany’s council kills the man and Dany executes him in public, in front of city clearly divided with slaves on one side and nobles on the other. As rioting breaks out she flees back to her pyramid with the city going crazy around her. The episode ends with what sounds like the beat of massive wings getting closer to her, and Dany heads out to a balcony to investigate. Sure enough, Drogon, the biggest and wildest of her three dragons is perched above her. She gives out a sort of shriek and Drogon flies off, deeper into Meereen. His sheer size is quite impressive as he loops over the city and his wingspan is wider than most of the buildings. The other interesting plot point is when we get to Dorne and meet Oberyn’s family. 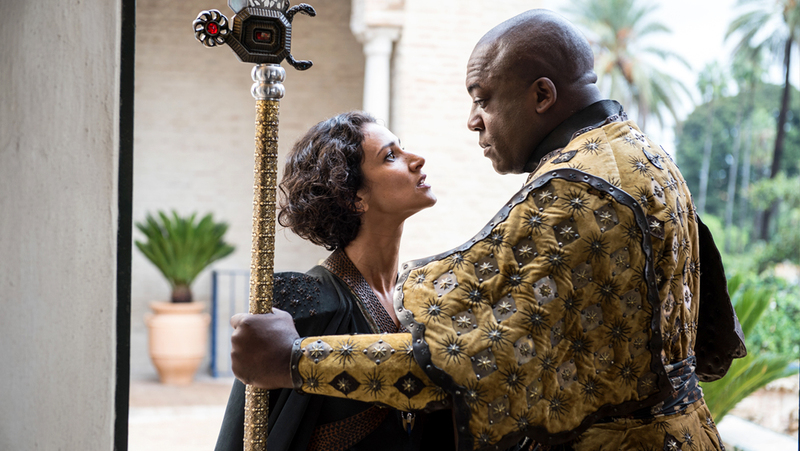 We finally meet Prince Doran Martell and one of Oberyn’s lovers, Ellaria Sand. Sand is looking for vengeance after her lover’s death and mentions that “the Sand Snakes are with me.” Readers of the novel are no doubt licking their chops as some of the most intense fighters in the series are no doubt coming in the next episodes. After two weeks Game of Thrones is really setting up the season to unfold with the same intensity of the past two seasons. Without giving away too much, we have much to look forward to in places outside of Westeros. With the changes Benioff and Weiss have made, anything is truly possible as the season moves forward.